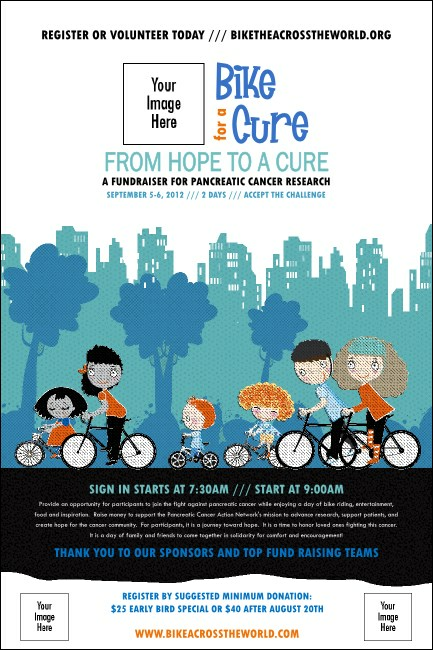 Raise the BPM of any rider who sees this exciting Bike For Cause Poster. Featuring unique caricatures that cycle through an urban sprawl of aquamarine and pastel blue, these Posters can help inspire some saddle time for your next cycling event. Upload three of your own images to the template for extra appeal. With Event Kits from TicketPrinting.com, you won’t just be hanging in, you’ll be ahead of the pack!